Just arrived home after midnight last night. We had a wonderful week in Maui. Perfect weather, food, activities, etc. I took enough pictures for several posts, but that will have to wait as I promised more Farm Chick stuff. I hope you all are not sick of Farm Chicks postings yet. I know it has been over a week and lots of bloggers have been posting about it. I promise, this will be it for me. I just wanted to tell you a little bit about the things I sold and show some pictures of the goodies I bought. which used to look like this and was posted about here. 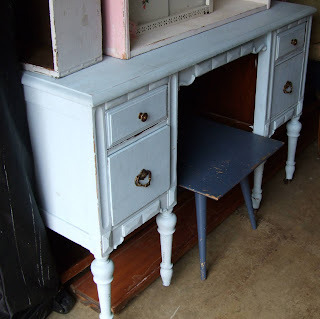 I also sold the cute little buffet you can see pictured on my last post. It was the one with the little barkcloth curtain. I am feeling a little sad about that one as I practically gave it away and have had it for a while sitting in my dining area. I just grabbed it at the last minute and took it as is. It was a really cute piece that I picked up at a garage sale and added the appliques, painted and gave it the little skirt as it's original doors were missing. What I didn't sell? Aprons, lots of people had them and some much cheaper than mine. My wallpaper screen didn't sell either. I think my price was a bit high, but that's okay as it will be great to take to Expo. For as much as I sold, I still feel like I had a lot to take home. Including these treasures I found. The trunk/bench is Isabel's, but everything on it and in front of it I got at the show. Click away for a close up. The great hat boxes were a steal at $5 a piece. Love the tickings (did I really buy more? )and the wallpaper I got from Heather. 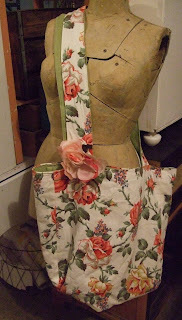 I even got three more aprons, vintage pink rick rack, an adorable vintage roses tablecloth (keeping or maybe jackets? ), pink sun glasses with rhinestones, a western belt for a project I have been planning, little bride and groom, lovely blue and white chenille spread, old basket, millinery rose, barkcloth era fabric, little pink chest with ugly black vinyl top (makeover on it's way) and some sweet crocheted hangers. I love these and wish I had gotten more. From the same dealer I got the hangers, table cloth and white apron from, I also got these cool old watch faces. She had a ton of them. Isabel bought the cutest watch face bracelet which were all sold out by the time I got there. I got this neat huge barkcloth tote from the talented Lisa Souers who I don't think has a blog, but she sells on ebay under the user name lsouers1. 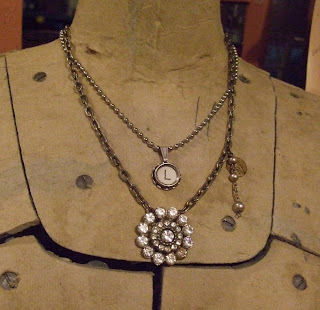 And finally, I purchased two necklaces. The initial one I got from the adorable Adrienne and the rhinestone one I bought from Heather Bullard. I'm so glad I got it at the show. I noticed on her website that she listed some recently and they are all sold out. I feel so lucky to have gotten one of her beautiful creations. Thanks Heather! While in Spokane I was able to hook up with some of my old college friends. Keith and Kris and I were all at Oregon State together majoring in Hotel and Restaurant Management. Keith is now the Director of Sales for the Spokane Visitors Association and he and Kris have moved around quite a bit over the last several years. I'm glad they are now in the PNW and hopefully will be able to see them more often. We had a yummy and fun dinner at PF Changs and I really enjoyed catching up with them and visiting with their lovely daughters. 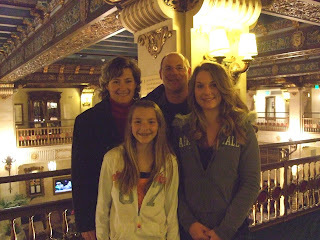 Here they are posing in the mezzanine of The Davenport Hotel a truly fabulous place. Wish my picture had turned out a little better. Well, there you have it. No more Farm Chicks, until next year of course. Come back soon for some pictures of our trip to Maui. Hi Lisa! Welcome home twice. It's been fun visitng lots of people that went to Farm Chicks. Silly me, we planned or trip to L.A. the same time. Sure wish I went to Farm Chicks...let's just say I'm gonna try my darnedest to be there next year. Thanks for sharing your finds. I have that little bride and groom too - aren't they the sweetest!? Looking farward to seeing your Maui pics. Can you believe how cold it is here in the PNW. You did well, sweetpea!! If I had that dresser I'd be ecstatic!! You were in our neck of the woods then, lovely chickee........Maybe hubs and I will drive up for next year's event. Hello, I just wondered if you ever sell the shopping carts or shopping cart liners online? I have been looking for one forever...Please email me if you do. Oh wow, I love the pink and white dresser. So nice! Thanks for stopping by my blog...sorry you missed the giveaway! But glad to hear from you and I just love following all of your sales and great creative things you do. 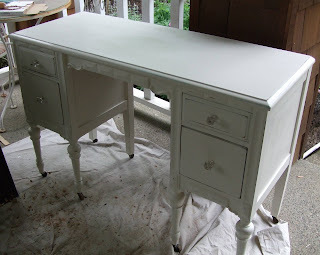 That dresser is amazing, can i ask what kind of paint you used on it? 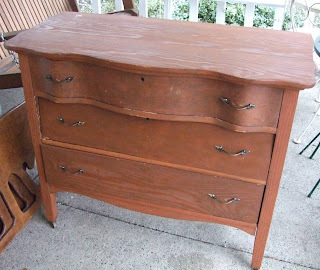 I have an old dresser i would love to paint but i'm scared of buying the wrong stuff for it! Thanks! I'm so jealous of what you bought! I wish I could find such awesome treasures around here. I'm so glad, too, that you were able to sell enough to make going worth it. Good job! oooh! 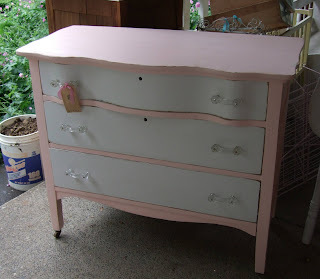 I love that pink & white dresser you re-did. Somebody got a good treasure! Guess What!! 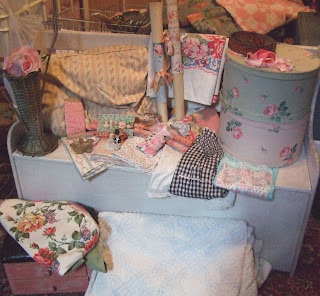 i am Rachel..the girl with the turqouise stove @ Farm Chicks that bought your pink and white dresser..and we LOVE it!! So sweet! 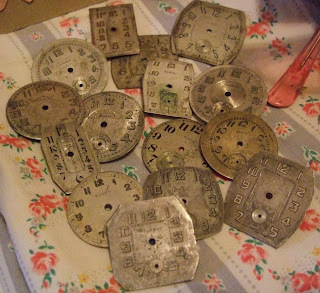 Oh my goodness Lisa I love everything - especially the old clock faces - are you selling them?